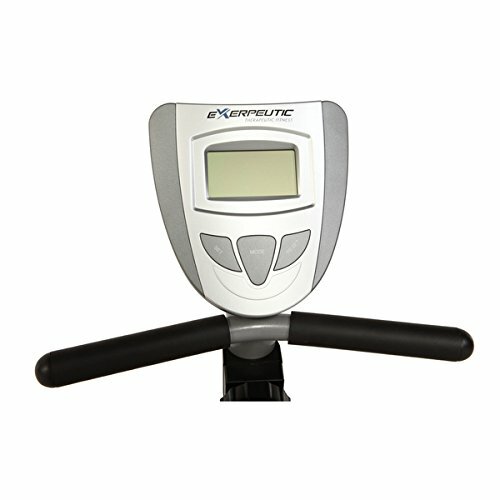 Exerpeutic has long been known for its excellent recumbent design as well as other exercise bike models. As the time I was looking for a home exercising bike, serving every family member with an under $200 budget. Then I found this one on Amazon with several positive reviews. Most of them are about large-size seat and comfortable backrest, which are distinctive features of this recumbent bike. What makes me curious about the Exerpeutic 1000 High Capacity model is a small handlebar under the screen, I guess it can support the forward riding position, such as that of an upright bike. Other features like pedals, computer look similar to other recumbent model but let’s see how they impact on different training sessions. Recumbent bike has been long well-known for its relaxing and comfortable design. “Sit and lean on the back” might be the worthiest description for the comfort of an exercise bike. In brief, Exerpeutic recumbent bike basically consists of: seat and backrest with adjustable height, handlebars, pedals as well as LCD monitor. In comparison with another two popular models from Exerpeutic, foldable and upright bike, recumbent design owns some significant advantages. First, recumbent bike with a backrest can reduce most of the stress caused during the exercising. Instead, I feel a lot more comfortable sitting and “chilling” with the exercise. This is considered a response to customer’s feedback on back hurt while working with a forward biking position of upright bike. Second, recumbent model has a larger size seat over the foldable one. Again, user experience is focused with an aim to encourage people to stay in shape right at their home. Moreover, the recumbent design is easy to get on and off, which is suitable for those overweight or old people. My 80-year-old grandmother does biking twice a day, morning and afternoon with really high motivation and satisfaction. She has gone over 1000 miles so far and still on daily workout. The assembly is easy following the instruction. At first I am a bit freakout with tons of parts mentioned, but most of hardest one is pre-assembled by the manufacturer. Then my work is to remove bolts, attach the part to another and reinstall the bolts. The assembly takes me one hour on my own. You should get another one to support you, it will be faster but if you don’t have anyone else, that is not a big problem. The only thing I feel to have on this bike are bells and whistles to hold the bottle or smartphone. However, if they cost an extra, it is not worth that amount. This Exerpeutic bike is relatively sturdy, which can carry up to 300lbs capacity. Although this is not an outstanding capacity like it is of Exerpeutic 4000 model, 325lbs, 300lbs is still a standard number of most recumbent exercise bike. This capacity is hence suitable for overweight, obese people who are on a hard training to burn fat. In addition, 300lbs is just a “recommended” number for user, it still works well with my 310lbs friend, as long as there is too much difference, it is fine. Of course, other people with different training purpose such as muscle toning or simply keep in shape could work with this bike. The bike might work best with upper teenager (16+ years old) and adult. Children should not exercise with this bike, instead outdoor sports is more advisable to them. As regard sturdiness, I use this bike almost everyday with my parents and grandmother, it stays stable and there seems no feeling of wobble even when I pedal at high resistance and speed. The bike offers 8 different preset-level, enabling several training exercises. The adjustment can be made by adjustment knob placing under the seat. In order to raise the tension, you can get it easily done by rotating the knob counterclockwise or vice versa to decrease. As the tension goes up, it will be harder in a pedaling motion and there will be a quite large difference between level 6 and 7 which I personally feel difficult to reach. Each tension level is suitable for specific workout exercise and purpose. For example, if you are on a training to lose weight, it is about burning as much calories as possible. Thus, you should in this case set the tension as average of 3 or 4, and try to bike as your best. The longer the time, the more calories is burned. In contrast, muscle toning exercises focus on the high tension, in order to tear out the muscle for new stronger one to be built. This bike works for both gym buffs or fitness starter. Even people with heart problem would benefit from this exercise bike since they need a training therapy to monitor heart rate. My cousin as a physical therapist often suggests this Exerpeutic bike for his patients, of course under his regular evaluation. Other people in special conditions such as knee replacement could start the treatment at low preset-level as 1 or 2, it will not cause any side effects to your situation but stimulate the recovery process. The bike is equipped with a LCD-screen with friendly user interface. It has basically main workout metrics such as Speed, Distance, Time, Calories and Pulse rate. User can choose among single function mode, depending on their workout exercises. For example, people are trying to burn fat may only set the timer to elapse together with average tension level. Or they should sometime switch to read how many calories has been burned during the training to determine whether they have reached daily goal or not. For those who are working to improve stamina, then time, distance and speed will be the features to be focused on. Beside single function, this bike offers scan mode, showing all the metrics every 4 seconds. This mode gives user a general view of their exercise performance. All the metrics are showed in big and clear view for easy reading while riding the bike. However, the disadvantage of the screen is that it has no light underneath. Especially in the poor lit spots such as kitchen, it is difficult to read what is on the screen. This gets harder and harder for my mother and grandmother whose eye vision is not as good as the old time. The screen is power by 2 AAA-size battery on the back of it. Batteries are not included in the pack, so if your pack is on the way, make sure you have batteries available at home. The replacement is easy as remove the cover, insert 2 new batteries and recover it. Notice that replacement can reset all the metrics and data. Thus, make sure you have all the figures noted down before replacing battery. The bike is equipped with large seat pad together with comfortable backrest. The seat is 18 inches from the floor and a bit higher than the pedals, giving an enjoyable downward biking experience. I emphasize on “enjoyable” as it is so relaxed while sit, leaning on the backrest and riding. Without any stress on the back, all the muscle group to work is concentrated at legs. In addition, the seat is 16 inches wide, the same size as Exerpeutic 900XL bike. If you just need a large enough seat size, choose 900XL since it is $40 cheaper than this 1000 model. Not a small deal! The seat can be adjusted forward and back using adjustment knob. The “forward and back” here is not like slide on the frame but instead, like a clock hand move left or right. The seat has around ten different seat positions forward and back, allowing about 12″ of adjustment. It can be adjusted by using adjustment pins under the seat, which is really hard for me to find and use. It requires you to pull out on a pin and scoot forward, then loosen two screw type pins then move the seat to your preference. Because they are located under the seat, I cannot adjust the position while riding and need to stop for a while for it. The large backrest is a bit backwards, providing better resting experience. It is designed for users of 5’3″ to 6’3″ tall; however, I am only 5.1” and it works for me still. In addition, there are two side handlebars with distance of 19.75″ for more balanced riding. This bike specially has a shorter bar placed under the screen to change the riding position: you can then bike with forward position like an upright model and back to rest after that. Together with basic metrics such as time, distance, speed or calories burned, the bike has additional heart rate measured by the hand pulse sensor system. This sensor is located on the side handlebars, measuring the heart rate through user’s hands and display on the screen. This function does not require any activation step; instead, all you need to do is place both hands on the bars and it automatically works. This is convenient for people with heart problem as they could know how fast their heart is beating through the sensor, and if it is about to exceed safety limit, they can slow down the speed to control it. So far, I haven’t had any difficulty using this function, as people review there need to be damp hands for the sensor to work but my bike still work fine from the beginning of exercising. One of the noticeable advantages of recumbent bike is greatly smooth and quiet pedaling experience and Exerpeutic 1000 is not an exception. Equipped with magnetic tension force, which is a restoring force, it acts to straighten bent magnetic field lines for more comfortable activity or exercise. The bike is so smooth that you wouldn’t feel any hard to pedal even with knee problem. Again, this works also for treatment purpose, e.g knee replacement, it aims at providing the most comfortable riding ever. Moreover, the precision balanced flywheel makes it steady while pedaling, together with two handlebars, you could easily strive to your highest speed and tension. There is no feeling of wiggling side to side as it always happens when biking at sitting position. In addition to smoothness, the bike operate in completely quiet. I often read my kindle or watch TV in living room and let the time flies. It obviously does not distract me from entertainment or even when I ride it in the morning, it does not wake anybody up. The pedals are fit to any foot size due to safety straps. These straps also hold your foot tightly, keeping it from slipping while pedaling at high speed. You can pedal forward or backward, depending on your exercise. Finally, the leg length is adjustable by modify the seat position. I often set as my legs can stretch to a comfortable extend horizontally cause I feel it create more impact on my legs. The bike weight 63lbs, an average weight for a home exercise equipment. There are 2 wheels under the bike for user to move it around after use. The wheels is friendly with several kinds of floor, including hardwood, tile, berber, flat surfaces; there will be a slight dragging with carpet. The advice is except locate the bike fixed on the carpet, you need to find a space out of carpet for easier transportation after finish exercising. It is much lighter with the help of wheels; thus, it is not a big deal with my parents. This Exerpeutic 1000 needs a regular cleaning and maintenance to notice. After every training, I often take a soft cloth and clean the bike with mild detergent to get rid of some dust and sweat leaved. All the maintenance and troubleshooting instruction can be found quite detailed in the manual. You can leave it in any small space such as room corner, under dining table, etc. It is super-saving space. The majority of reviews are happy with large seat and backrest, together with handlebars work as balance support and sensor system. The quiet and smooth pedaling systems satisfy customers as they often do another thing like watching TV or reading book and it does not distract their entertainment. However, lack of lighting screen is a disadvantage since people will get hard to read the metrics in places such as kitchen or people with short-sighted vision. 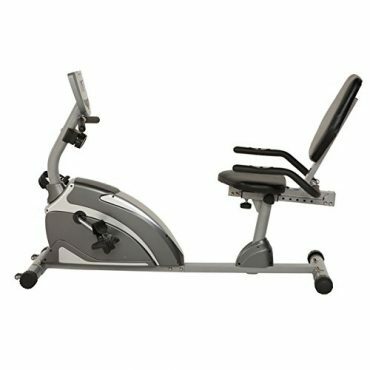 A price of this bike is a reasonable price for a home equipment which is easy for everyone to exercise and support excellently their training purpose. In general, I am personally pleased with this bike regarding its recumbent design with some supportive and helpful features. 300lbs capacity is quite enough for most of those who want to lose weight and burn fat. 8 different resistance is suitable for almost kinds of exercises, although it has quite big differences in the last 3 ones. There are basic metrics like speed, distance and even pulse rate for people with heart problem. What I love most probably the quiet and smooth pedaling experience, while I can do multi-task with it. Finally, the price is acceptable for me to adapt and invest in a long-term home equipment.